At The Bike Bank we offer workshop training programmes that will last 3, 6 or 12 sessions, where we will be able to teach you how to repair and maintain a bike. We aim to create a calm, supportive environment where you will be accepted as one of the team. Our focus is on learning practical skills in a ‘work like’ environment and you will be expected to keep good time, to adhere to our workshop rules and so on. 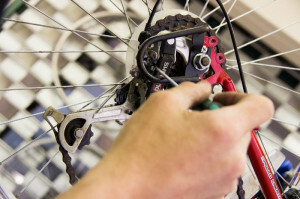 Upon completion of the Trainee Mechanics programme you will get a certificate of attainment and could be offered the opportunity to refurbish a bike for yourself. So if you receive support because you have been homeless or vulnerably housed, experience mental ill health, have a learning disability, have been unemployed for a long time or are a care leaver and feel you would like to learn practical skills in refurbishing bikes then please download the application form below or contact Carole on 01392 284280 or 01392 205800 for more information.